On 9/9/2015 Realty Income announced a raise of the monthly dividend to $0.1905 per share. This is an annual dividend of $2.286 (assuming this dividend times 12). This will be payable to shareholders on record 10/1/2015. This is a small 0.26% dividend increase. 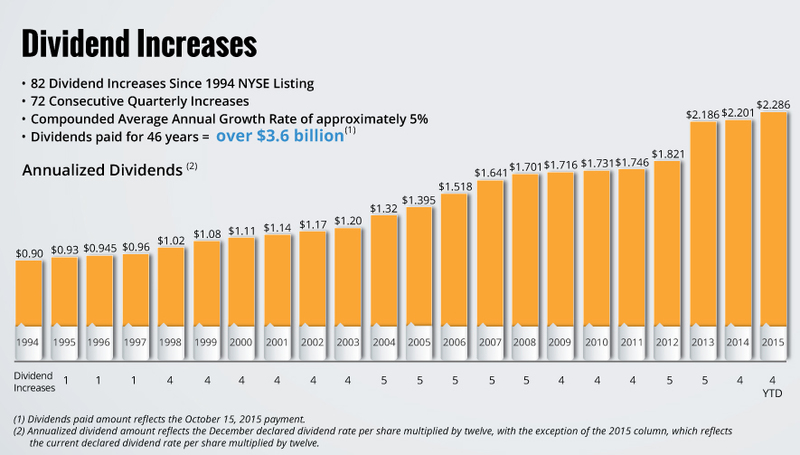 Realty Income is known to increase their monthly dividends often (many times per year). In October of 2014, the payment was $0.1831042. The presently declared dividend is 1.04x the one paid last year. Not bad for an increase for a consistent REIT monthly dividend payer. With the current dividend, O yields 5.07% as of today. Realty Income is a core holding in my portfolio. All dividends are reinvested to buy more shares.